Back to California and to the bridges in the Sierra Nevada foothills and mountains. We previously explored Placer County and Nevada County to the north. Now we'll look at bridges in El Dorado County to the south. 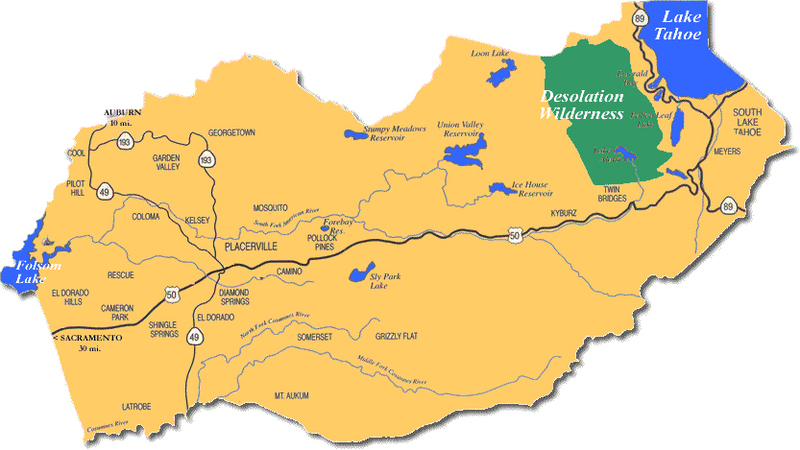 El Dorado County is south of the Middle Fork of the American River, north of the Kit Carson Trail, and between Lake Tahoe and Folsom Lake (map courtesy of Wikipedia). It's where James W. Marshall found gold at Sutter's Mill in Coloma. Today's bridge carries Salmon Falls Road over the South Fork of the American River just east of Folsom Lake. It's a 509.9 ft long steel girder bridge with a 228 ft long Warren truss center span. The bridge was built in 1953, probably as part of the rerouting of Salmon Falls Road with the construction of Folsom Dam. The old road was to the west and became innundated when Folsom Lake formed behind the dam. I went to the end of Old Salmon Falls Road today to see if I could see the old bridge, but the water level was still too high. Luckily, other people have posted photos of the old bridge when the lake was lower such as some nice photos by Smugmug. El Dorado County, California Bridges: Salmon Falls Road Bridge over the South Fork of the American River (1) by Mark Yashinsky is licensed under a Creative Commons Attribution-NonCommercial-ShareAlike 3.0 United States License.